INDIANAPOLIS, IN (May 1, 2013) — Continuing to fill out a busy summer schedule, Andretti Autosport Short Track announced today that third generation driver Jarett Andretti will compete in every pavement United States Auto Club (USAC) Traxxas Silver Crown Series event. The Silver Crown Series is one of the most prestigious in all of open wheel racing and lists Jarett’s father John and great uncle Mario Andretti as graduates. 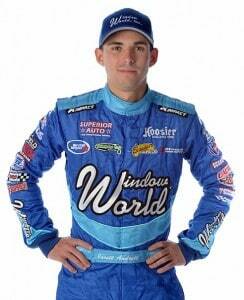 Window World, Inc.®, a long time supporter of both Jarett, and his father, will be the primary sponsor of the No. 4 Window World machine. The car will also carry associate sponsorship from Superior Auto and Stoops Freightliner during the series’ five-race pavement schedule. For Andretti, who is already committed to a full dirt sprint car schedule throughout Nebraska, the Silver Crown races will add additional experience to his promising racing career. Window World of Omaha is locally owned and operated in Omaha, NE. The store, located at 13229 I Street Omaha, NE, serves homeowners in all areas surrounding Omaha, including Douglas, Cass, Dodge, Lancaster, Sarpy, Saunders, Buffalo, Hall, Pottawattamie, Otoe, Gage, Johnson, Jefferson, Saline and Seward counties. For more information about Window World of Omaha, visit www.windowworldomaha.com or call (402) 537-7313. Window World Powersports™ is the line of automotive and motor vehicles developed and maintained by Window World, Inc.® The collection was initiated in 2009 and has now grown to seven vehicles: the No. 43 Indy Cup Car, the No. 34 Window World Cares Cup Car, the Superbird, the Window World Chopper, the St. Jude Dream Bike, the Veterans Airlift Command Bike and the Stinger. The Stinger, developed by John Andretti, Andretti Autosport and Window World, is a tribute to the 1911 Marmon Wasp, the first winning Indy 500 car. The traveling vehicle showcases the signatures of former Indy 500 starters. For each signature received, Window World makes a donation to Window World Cares®, the charitable foundation of Window World. For more information on the Stinger or other Powersports vehicles, visit www.petty-andretti.com.